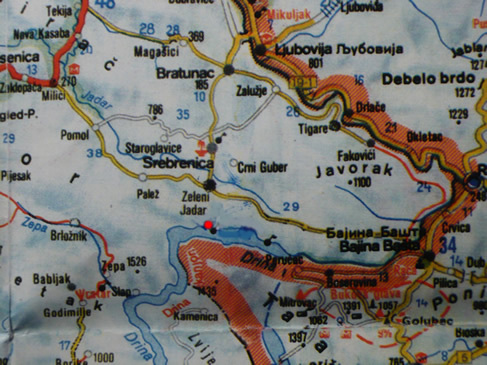 Klotjevac is a small village situated on the Drina River, directly south of Srebrenica.In the early years of the war, the village suffered shelling and gunfire from across the river in Serbia. Over one hundred homes, the local mosque and the nearby elementary school and post office were destroyed. In addition, villagers were killed by the shells and sniper fire. Later, the Klotjevac residents fled to the UN designated safe area of Srebrenica, where the fate of July 1995 awaited them. Before the war there were approximately 300 residents. Now, as a result of the genocidal war, only about 10 residents have been able to return to the village. Special thanks to my friend Omer Sulejmanović for all his help in the preparation of this information. Omer was born in Klotjevac. Special thanks to Hariz Halilovich and Ron Adams for their permission to post this extract from a longer work.